The classic relish tray isn't seen much anymore, but I'm always happy to run into one. It's something between a crudité platter (but with olives or another salty element) and an antipasti plate (but with more raw veggies). It can be put out before the other food arrives, to crunch on with drinks, or sit on the table while a meat-and-potato dinner is served. Again, providing bites of crisp freshness during the meal. 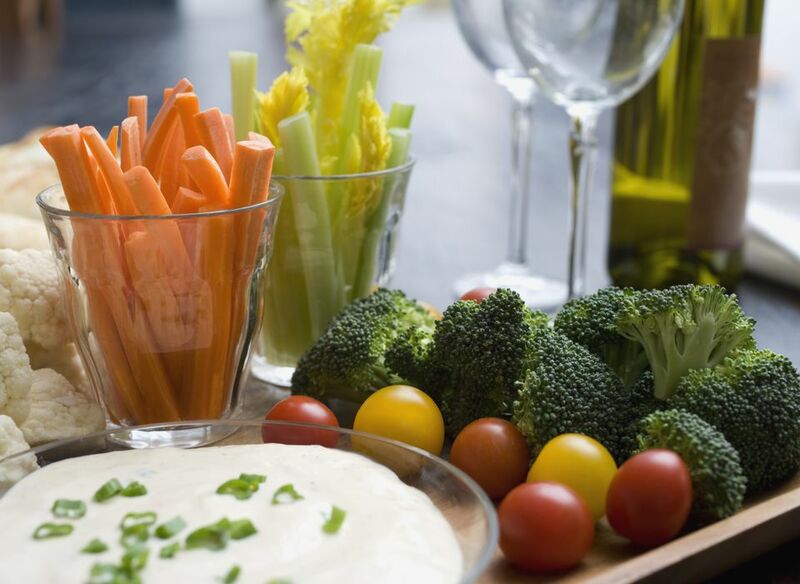 Dips and spreads are not traditionally part of a relish tray, but we've been known to place a small dish of sea salt in the corner of the tray for people to dip the veggies into if they're so inclined. Follow these steps to create a basic relish tray, and keep going to dress it up and make it as elaborate as you like. Crunchy carrots, peeled and cut into long, elegant sticks are the traditional star of a relish tray. Mix things up by using different colored carrots, or, get kicky by serving pickled carrots instead of the plain raw version. Chilled celery provides a refreshing crunch with every bite. Be sure to taste the bunch you have on-hand first since older celery or celery grown under too much heat can take on a bitter edge that you may or may not want to include on your relish tray. Trim stalks and cut them into long, elegant strips, whether in half, thirds, or quarters. Along with carrot sticks and celery sticks, olives are the third leg of the stool of a traditional relish tray. They add a salty burst, which is a lovely counterpoint to the crunchy sweetness and crispy mildness of carrots and celery. Classic versions add canned, pitted black olives, which are dandy, but we tend to select tasty delights from the olive bar at my local specialty grocery store. If you want to serve them pitted, you can always pit them yourself. With these three components, you have a relish tray. But you can keep going, adding more elements to dress it up. The bright crunch of fresh radishes adds both color and a bit of sharpness to a relish tray. Rinse them clean, trim them, and serve whole or cut in half or into quarters. If their greens are in okay shape, we like to leave a bit of them attached for a pretty effect. The anise/licorice flavor of fennel is a palate-cleansing addition to a relish tray. We like to trim off the long dark green stalks, trim the bulb, and cut the bulb into thin-ish wedges. Not pickles, but time in a vinegar marinade transforms these marinated mushrooms into something special. They add plenty of flavor—and a wee bit of intrigue—to a relish tray. This marinated eggplant provides a similar effect (although you'll need a fork to eat it!). The bright, snappy nature of pickled asparagus adds a nice salty, vinegary element to a relish tray. Just be sure to pat them dry before adding them to the tray, so the brine doesn't get all over the place or drip down people's fingers. Like pickled asparagus, pickled green beans can stand on their own as a snappy little snack. Some pickles—the pickled carrots, pickled asparagus and pickled green beans already mentioned, as well as pickled okra—work like additional vegetables on the relish tray, while other pickles join more of the tasty tidbit role, much like olives. To that category, we can suggest pickled garlic, pickled garlic scapes, pickled cherries (pictured), lemon pickles, or zucchini pickles. Kick things up a notch with some unusually spicy additions to your relish tray. We highly recommend these Korean-style brussels sprouts (pictured). But pickled jalapenos are tasty, too, as are these spicy cucumbers. Nothing too sweet, mind you, but fresh summer berries scattered about a relish tray add a soft touch. Sweetness can also be added with a dollop of cooked fruit, such as fig coulis, cranberry compote, or plum chutney. Are you still looking for still more ideas? See these suggestions from my colleague, Sean Timberlake at Food Preservation, has these lovely condiment ideas.